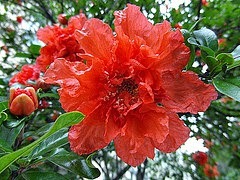 L. Punica granatum, Heb Sp mangrána, Eng. pomegranates (fruit). The word is derived from the Latin granate, the fruit, not the Moorish Kingdom in Andalusia. Although a native of Syria, the Persians cultivated and disseminated it throughout all areas capable of growing it including Andalusia. 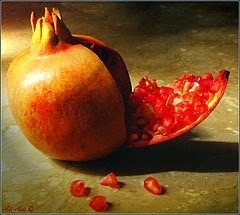 There are sweet, sour and semi-sweet pomegranates. Villena instructs to peel off the leathery skin starting from each end. Then quarter the flesh and discard the cream colored membrane surrounding the seeds. Cut the flesh into small chunks saving the seeds as they were valued more than the fruit. Desserts made with them were thought to be the finest and most delicate. The north might have currants, strawberries and raspberries but the flavor of a pomegranate beats all, according Andalusians. Throughout Al-Andalus, the pomegranate was a fundamental fruit for cooking in general, from meats to fish, for the sick and the healthy and in cakes and sauces. 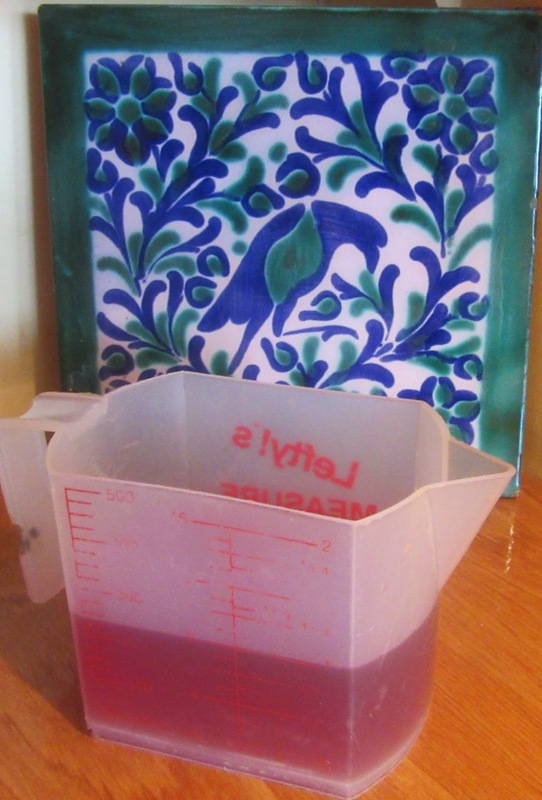 There pomegranate syrup was made with equal amounts of sweet and sour pomegranates and sugar boiled together until it thickened. This keeps indefinitely without refrigeration and is used for making a cold drink by adding water. By adding almond milk or water, it is used in blancmange or in roasts. The cold drink has been imbibed to quench the thirst. Avenzoar claims making syrup with only bitter pomegranates was more efficacious than a syrup of sweat ones. It is prescribed for fevers and to lighten the body. It alleviates dry coughs and throat irritations. Avenzoar, however, states that its fundamental properties are to stop alterations of food in the stomach and to impede food from spoiling. Nola called for cajín (green, bitter pomegranates), also known to relieve high fevers and added to nine sweet and sour dishes (see agridulce) for which he gives recipes. Further, Nola wrote about a wine made with pomegranates and a juice made from the seeds and left to sit in the open air for one night. During the first half of 11 C Aetios, the Greek physician, prescribed it for birth control. He advised men to smear it on their penises to avoid conception. It was given to pigs to eat for the same purpose. The bark from the root was prescribed as a strong purgatory to liberate oneself of rebellious humors and to kill worms. 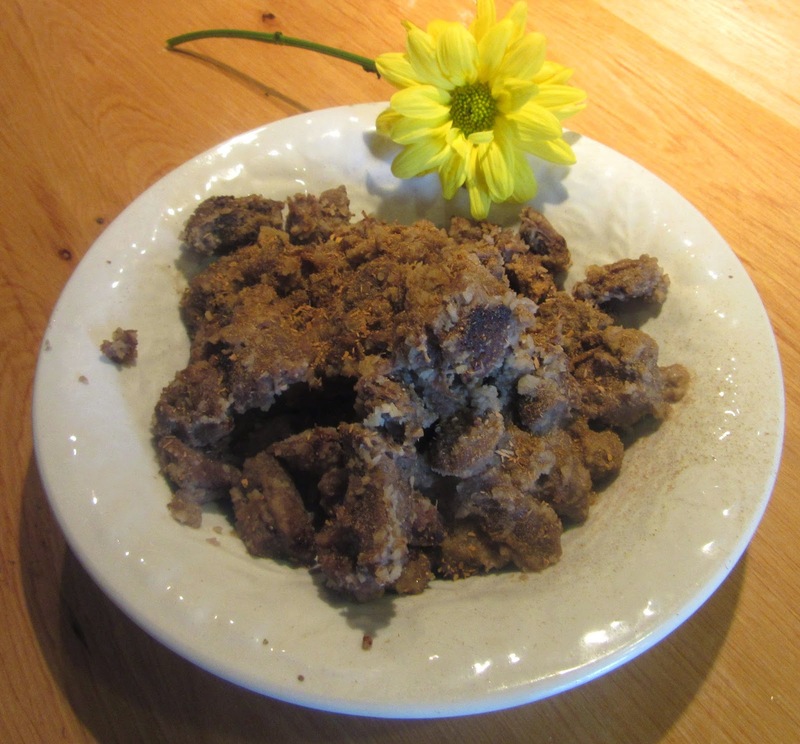 The seeds appear in Sommachia a dish consisting of sumac and lemons. Cut the meat up small and fry with oil and salt, and when it is brown, cook it until done in vinegar. Pound a handful of almonds or walnuts and throw them on and gently boil a while. Dissolve a lump of sugar in pomegranate juice to eliminate tarness and sprinkle with cinnamon. Perry says this is a Persian name but neither he nor Huici explain the meaning. As pomegranates were not in season, ready made juice was used. As it was sweetened, sugar was not added.